This article originally appeared in in June 16, 2005. Introduction ------------ Many man-made and naturally occurring phenomena, including city sizes, incomes, word frequencies, and earthquake magnitudes, are distributed according to a *power-law distribution*. A power-law implies that small occurrences are extremely common, whereas large instances are extremely rare. For example, there are few large earthquakes but many small ones. This regularity or "law" is sometimes also referred to as *Zipf* and *Pareto*. Power-law distributions have been observed for the degree of connectivity of nodes on the Web [](#Faloutsos:99), the distribution of network messages, web-site and weblogs rankings [](#Kottke:03), class relationships in object-oriented source code [](#Wheeldon:03), and the number of references to run-time objects during the execution of Java programs [](#Potanin:05) to name a few. The power law of natural phenomena and computer and network artifacts demonstrates a striking common property: scale-free geometry. Scale-free geometry is very different from the geometry of a graph in which links are randomly distributed among nodes. In a random graph geometry, nearly all the nodes have approximately the same number of links. Thus, every random graph has as its "typical scale" the average number of links per node. By contrast, the Web has no typical scale to its connectivity, a property closely related to fractals [](#PhysicsWeb). I thought it would be interesting to see if XML Web services are also scale free. If the complexity of Web services is scale free, there is no typical Web service application size or complexity, which in turn might suggest that there are no limiting factors inhibiting the use of the technology in real-world environments for developing increasingly complex Web service systems. Thus, it is reasonable to say that the scale-free properties of Web service application size or complexity (not popularity!) are observed, the technology has outgrown the "toy examples" stage. Testing the Hypothesis ---------------------- To test the scale-free property of a reasonably large collection of representative Web service applications, I downloaded and installed the entire set of over 400 WSDL files from XMethods [](#XMethods), a free repository of publicly advertised open Web services. Now, to determine power law distributions, we need to check if the number of occurrences Nk of some event of size k is proportional to k raised to some power. The easiest way to see a power law is to plot N versus R on logarithmic scales; if the distribution follows a power law, we would expect to see a straight line with slope s. One drawback is that it is not possible to directly compare the sizes of the WSDL files to rank them, because the XML-based layout of WSDL files can vary significantly. Some files are hand-made, others are automatically generated, and a few include large portions of documentation. A couple of WSDL files require importing other WSDL files and/or XML Schema files. To normalize the WSDLs, I used the wsdl2h translator of the gSOAP toolkit [](#gSOAP) to convert each WSDL into a C++ header file format. The wsdl2h tool automatically imports any dependent WSDLs and Schemas and verifies the correctness of the content (about 10 WSDLs out of 408 were rejected due to content errors). I then counted and ranked the number of lines of source code in the output produced by wsdl2h for each WSDL. The results are shown in the figure below. 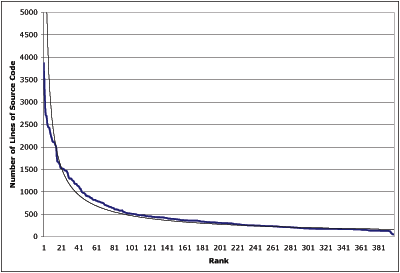 The Web service rank according to application size in number of generated source code lines indeed follows a power law distribution.